Protect data of your entire SharePoint Server and reduce costs and increase scalability. IDrive’s granular backup / restore for Microsoft SharePoint Server helps in reducing costs, improves scalability and protects data of the entire SharePoint Server. 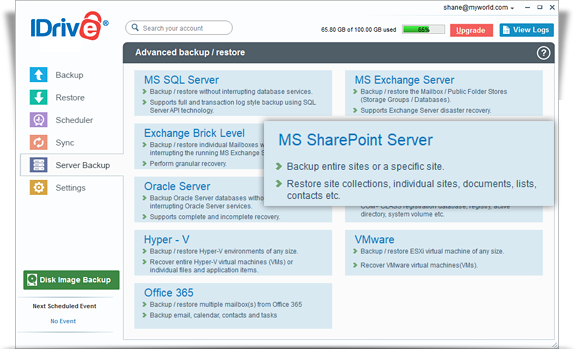 Efficiently backup an entire sites or a specific site with granular backup support for MS SharePoint Server. View the steps to backup the MS SharePoint Server to the IDrive account. View the steps to restore the MS SharePoint Server to the IDrive account.